Established in 1975 in the temple city of Bhubaneswar, Orissa Dance Academy conducts sustained training classes both for Indian and foreign students in its premises. It has own laurels for its glorious achievements in projecting and popularising Odissi Dance and Odissi Music in the country and abroad. Oengaged in tecahing rissa Dance Academy is not just another another institution Odissi Dance. Orissa Dance Academy aims at Orissan art, culture and promoting heritage through proper and intensive training talents and bringing the of yound essence of odissi dance to every corner of the an institution of globe. It is uncomparable credibility in imparting training in Odissi specialized Dance as a institution, it consists of two branches one of teaching and another of training and repertoire. The teaching and training department of Odissi Dance Academy has the unique pride of having talented teachers and outstanding gurus in its fold. So far it has maintained and served the sanctity and purity of the dance form, style and technique. 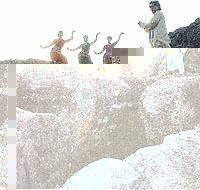 It has made innovation to inculcate new ideas into Odissi choreography keeping intact the basic features of the dance.